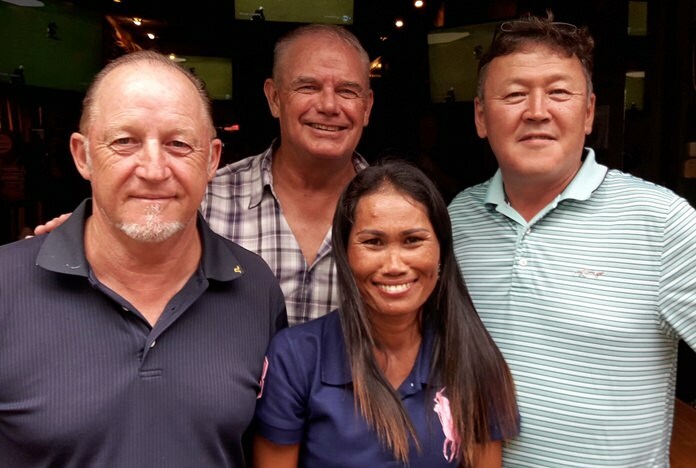 Gary Smedley (from left) with Fred Birch, Jareeporn Thomas and Ganbaatar Baasanjav. Jimmy Dundon is our lead story this week and after being with us for nearly 6 weeks now, he has delivered some fine scorecards. The leaderboard starts off with a trio at the 37 mark with Freddy Birch squeezing in with Mr. and Mrs. Thomas all good at third place. Our Aussie mate Alan McKendry will also be wheels up soon and his 40 points was yet another stellar round in his cap for sole second. Jim has had several rounds of 40 or better now that he has his land-legs back. Today he had a strong 41 for the win and to finish his great run this trip. It was a quick hop up the road to see what adventures the Mountain and Ocean courses had in store for our comp today. Everyone raved about the condition of the course, with some lads saying they had never seen it so good. It was a deadly Smedley double out there for a one-two on the rest of the field today. Brother Gary is visiting from Oz and creamed the field of 14 with a blowout 38 to destroy the lads by 8 points. Bruce Miller hung in for the tie with Captain Phil, but Brucie got the better hand with our Caddy Smile near pin notched on his holster. This last week we have seen a great rivalry, and scoring must be at the 40 point mark to have any chance at all. Today at Pattavia was no exception but this time Gary Smedley had his turn and just nicked Jimmy Dundon by a single point, a single putt. Richard Goodwyn took the near pin hole while Capt. Phil just got there at the 33 point mark. There was much talk about the greens here and just how perfect they were and how lush the course was. Those greens were certainly liked by Gary Emmett, who took the Caddy Smile near pin today. Greenwood, like yesterday’s Pattavia, is a local favourite and the quartet of golf course in this area (with Pattana and Treasure Hill) does give us some fantastic choices. High scoring was required for a podium placing and Fred Birch was up there again with a 39. A lot of lads will be glad to see the back of Gary Smedley as he contributes to the G.N.P. of Australia with 40 for second. The breadwinner of the Thomas household found the missus bringing it back on this occasion with an impressive 42 to get her on top of the heap. Previous articleHow to live to be 100 – or die in the attempt (guaranteed)!